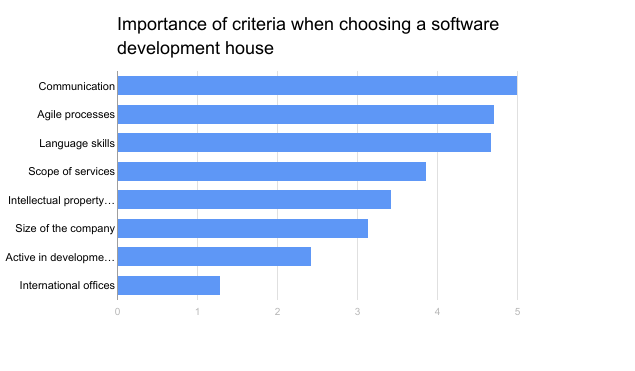 We have spoken with clients of software development companies to find out the decisive factors behind the choice of a specific development house. The findings are very coherent, communication is by far the most important factor. In this case, the term ‘communication’ includes transparency in cooperation as well as developers’ language skills. Besides communication, a proper agile process was consistently named as a secondary decisive factor. Not only were these criteria explicitly given the highest rating – they are often a solution for other problems mentioned by the respondents. The study was based on interviews with representatives of startup-like companies. Our respondents included CEOs, Heads of Business Growth, and Heads of Business Development. First, respondents were asked to answer four open-ended questions and then they were requested to rate on a scale from one to five the different factors which may or may not affect their choice of a development house. 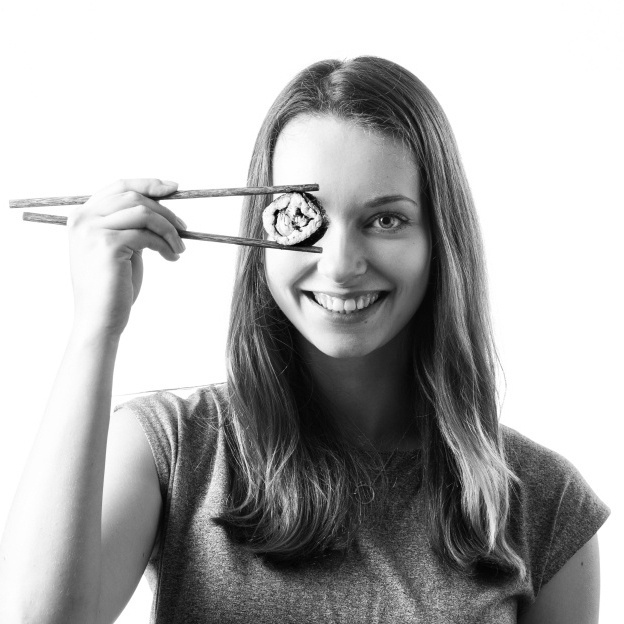 Respondents’ businesses varied a lot in their structure and size, but they had one thing in common: all of them used one of Netguru’s services in the past. The biggest problems with software development today? Three key factors were identified: time, skills and business needs. Respondents agree that MVPs have to be produced much quicker – without any delay. This is extremely important for clients and leads directly to the fulfilment of business needs. An MVP which is published quickly is already able to generate some revenue (even if it needs polishing, but there is always time to do that). Clients are pressured by investors and other stakeholders. It is a serious matter and cannot be ignored by developers. When it comes to skills, businesses see two main problems associated with that: the shortage of engineers in general and, more importantly, the shortage of engineers having the skills required to develop their product. Ideal solution for software development? All respondents agreed that real success can be achieved only and only if both parties are committed to a long-term cooperation. This will guarantee that the software developer will be updated constantly on how the client’s business is performing. Clients believe that their business goals will be achieved and their software product will be constantly updated and developed. The ideal solution consists of a product developed quickly and then polished over time. Any best practices for software development you would like to share? In this case, the responses varied quite substantially. Some respondents indicated that the best practices will be strongly dependent on the past experiences startups had while working with development houses. We asked the respondents to rate the aspects on a scale from 1 to 5 (from the least to most important). We can see three criteria that are almost universally important to all companies: communication, agile processes and language skills. Communication is crucial in maintaining good relationships as well as making sure that the business needs will be understood and the goals fulfilled. Being agile is associated with flexibility and reacting on market developments, which may affect a client’s strategic decisions. As regards language skills, English is always necessary, but the knowledge of other languages is a significant advantage. The scope of services is less relevant. The most important factor within this criterion was the availability of project management team. For some clients, intellectual property rights (understood as work done on an open source code, HQ located in a country with a good legal framework, and low levels of corruption) is a very important area. Yet, it should be noted that respondents who rated this aspect lower on the scale indicated that they should be treating it with more care. The size of the company is not really relevant for many respondents. Those who gave a higher score to this aspect indicated that the more employees company has, the higher the chance of having appropriate talents assigned to their projects. Both active participation in the development community and international offices are not relevant for business needs. One more important area was indicated: clients competing with one another. Working with external software development vendors means that close rivals can get easy access to the same talent. For competitive companies, there is a potential danger of sharing the same resources and losing their competitive advantage. Price: clients expect the product to be as cheap as possible while achieving the best quality. Project management: clients believe that a skilled project management team will allow agile methods to be effective in product development. A good PM team can also retain control over the whole process without endangering the client’s business goals and needs. The skill level of developers and the option of having developers work only on one project at the time. As a result of this study, we established that clients of software developers are afraid that the cooperation might affect their business goals negatively, which puts understanding business needs as the primary decision-making aspect when a client chooses a developer. It is not easy, however, to evaluate a given developer’s understanding of business needs. Clients are looking for companies that clearly state their commitment to transparency and working in an agile methodology. To conclude, clients first and foremost need to feel safe that the product will eventually meet the business goals and bring revenue. It is also one of the reasons why clients prefer long-term cooperation rather than one-off projects, because developers are only able to understand the business needs of clients when they have had the opportunity to collaborate and learn more about the clients themselves. Qualified project managers are of paramount importance here. The survey was a part of a study on competition on the software development market, a Netguru Labs initiative. Contact us for in-depth insights for your industry.